A draft of articles of impeachment has been prepared by Rep. Mark Meadows, a North Carolina Republican, and other members of the House Freedom Caucus. WASHINGTON — Deputy Attorney General Rod Rosenstein said Tuesday that the Justice Department "is not going to be extorted" as some House Republicans raise the prospect of seeking his impeachment. 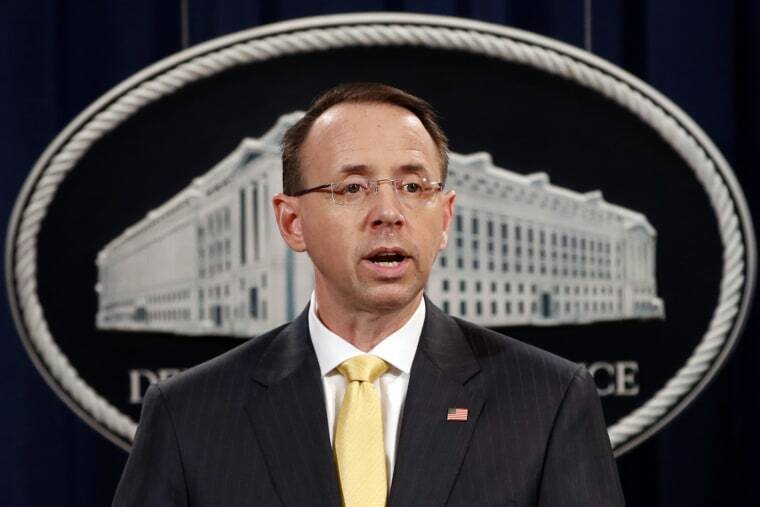 During an appearance at the Newseum in Washington for Law Day, Rosenstein was asked about a draft of articles of impeachment prepared by Rep. Mark Meadows, a North Carolina Republican, and other members of the House Freedom Caucus. They have pushed for the release of internal Justice Department documents concerning some aspects of the Russian meddling investigation and the Hillary Clinton e-mail probe. Some Democrats have charged that the escalating document demands are an attempt to back Rosenstein into a corner and compromise his supervision of Robert Mueller and the rest of the special counsel team. "They can't resist even leaking their own drafts," Rosenstein said of the Republican lawmakers' impeachment articles, which were first obtained by the Washington Post. "I just don't have anything to say about documents like that that nobody has the courage to put their name on and they leak in that way." The deputy attorney general said the Justice Department properly resists turning over some documents to avoid allowing Congress to interfere in investigations and to observe longstanding rules on keeping Justice Department and congressional investigations separate. "There are people who have been making threats, privately and publicly, against me for quite some time," he said. "And I think they should understand by now, the Department of Justice is not going to be extorted." "We're going to do what's required by the rule of law. Any kind of threats that anybody makes are not going to affect how we're going to do our job." All Justice Department employees take an oath to uphold the Constitution, he said. "We have 115,000 employees and if they violate it, they know they're going to be held accountable. And I know those folks know that I'm not going to violate my oath."